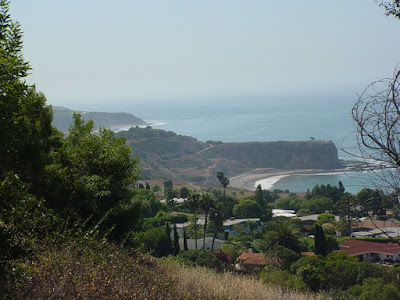 Southern California is home to an array of remarkable native shrubs. Many are more drought-tolerant than the non-natives commonly used in local landscapes. In addition, the natives have interesting and useful attributes that make them welcome additions to the garden. One such shrub – if one has the space – is our plant of the month, Laurel sumac. The scientific name is pronounced mal-OZ-muh low-RINE-uh. 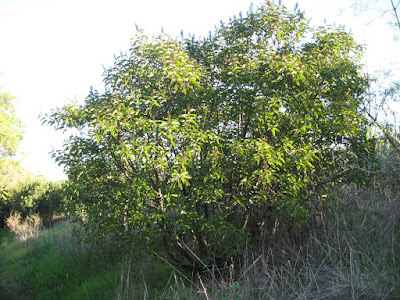 Laurel sumac is a member of the Anacardiaceae (Cashew) Family, which includes such well-known S. California species as Fragrant sumac (Rhus aromatica [Rhus trilobata]), Lemonadeberry (Rhus integrifolia), Sugarbush (Rhus ovata), and Poison oak (Toxicodendron diversilobum). 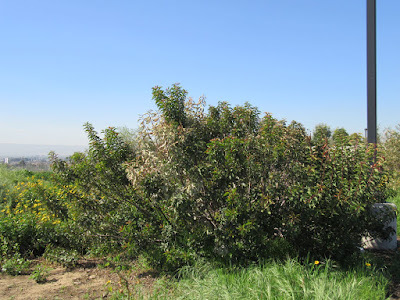 The family also includes Pistachios, Cashews and the non-native Pepper Trees often used in S. California landscapes. For more on this interesting family see: http://mother-natures-backyard.blogspot.com/2014/12/plant-of-month-december-lemonadeberry.html. 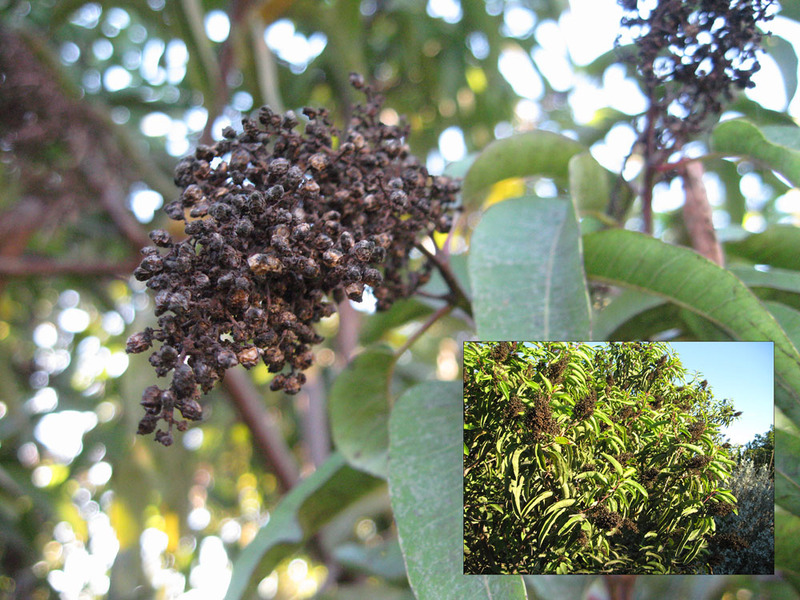 Laurel sumac usually grows on dry ridges and canyons below 3000' in chaparral and coastal sage scrub. It’s occasionally found in S. Oak Woodlands, but only where frosts are rare. Common associates are Black, White and Purple sages, California sagebrush, Toyon, Lemonadeberry, Sugarbush, Bigberry manzanita, California encelia and the Goldenbushes (among many others). Laurel sumac is a large shrub or multi-trunked small tree. At maturity, it reaches heights of 10-15 ft. (3 to 4.5 meters) and diameters of about the same. 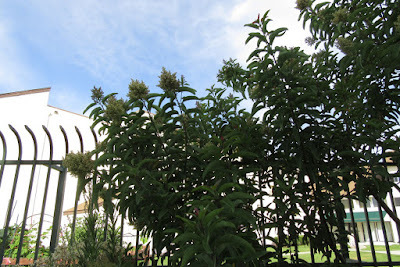 In favorable locations, a plant can be as much as 20 ft. tall and wide. The overall shape is rounded to slightly sprawling. 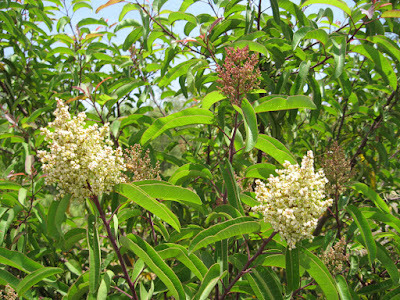 In the wilds, Laurel sumac can create thickets in favorable sites. This is likely due to seeds falling near parent plants. 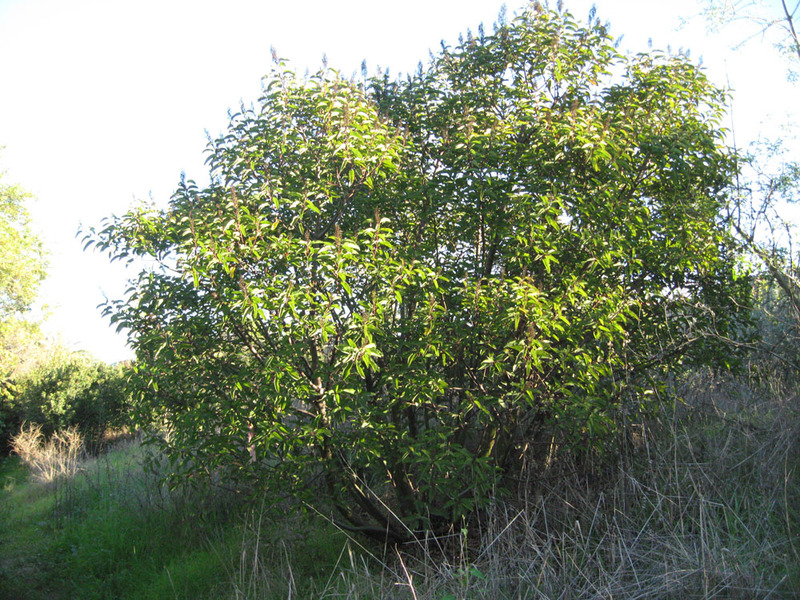 The trunks and branches are substantial, and like Toyon and Lemonadeberry, the wood is moist and rather fibrous. The bark on young stems is red-brown; it becomes an attractive pale gray-brown on older branches. The shape and bark color make this a good alternative to Oleander, Photinia, Pittosporum and Xylosma. One of the best reasons to plant Malosma laurina is its year-round interest and color. 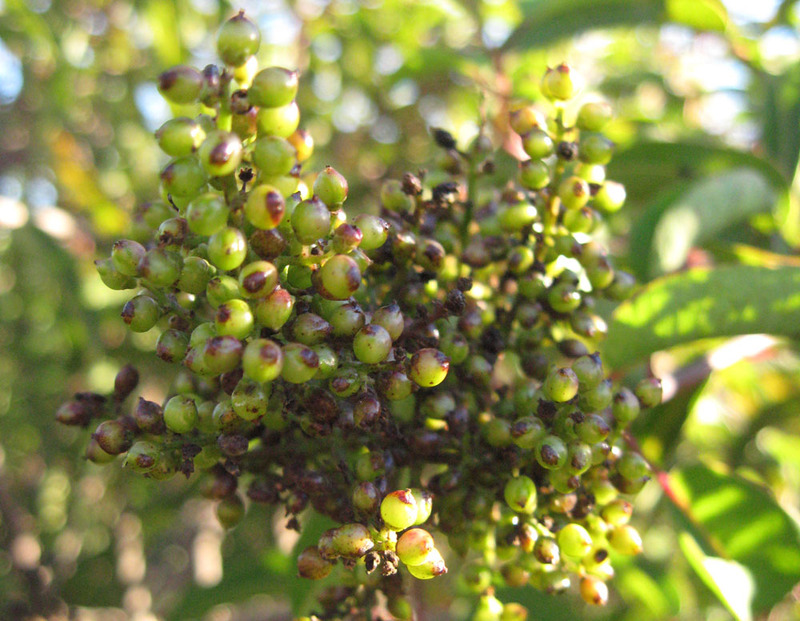 Laurel sumac is evergreen, a characteristic prized in and of itself. But ‘evergreen’ scarcely does justice to the variations in leaf color typical of this species. Young leaves and branch tips are a brilliant red/orange (above), due to anthocyanin pigments that protect from herbivory and sun-scald. This red color is often retained on the edges of mature leaves. 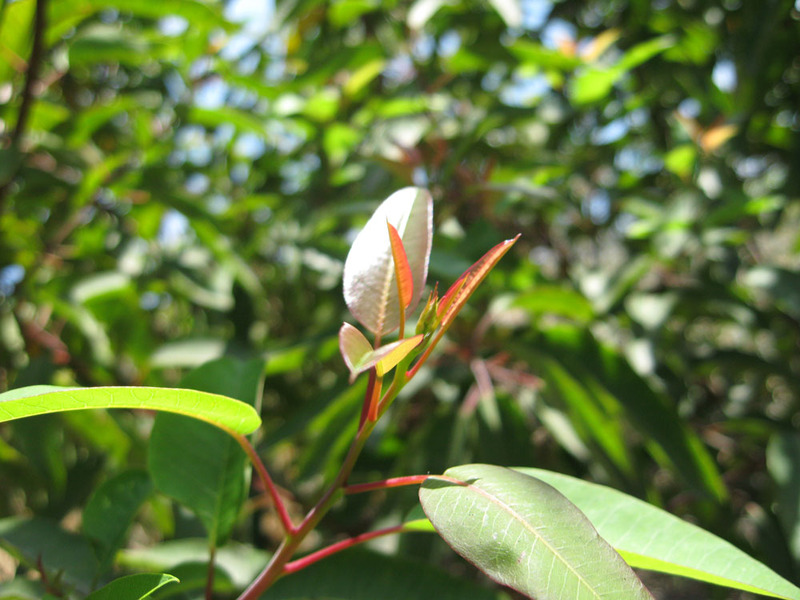 New leaves are produced year-round, even in summer/fall. Mature leaves are somewhat leathery, medium to dark green and folded along the midrib like a taco shell (see above). The leaves are medium to large – four to six inches in length. The leaf shape is simple and reminiscent of the leaves of the Laurel – hence both the common and scientific names. Senescent leaves turn yellow (below) adding to the colorful foliage in this species. The scent is a unique blend: bitter and somewhat fruity. It’s been described as the scent of bitter almonds, unripe apples or citrus. It’s an aroma unique to the plant, and for many, it’s the ‘scent of the California chaparral’. As a note of caution, some people have nasal allergies to the plant chemicals and/or pollen. In addition, the sap can cause contact dermatitis (short-term skin allergy) in sensitive individuals. Gloves should be worn when pruning or handing the plant. Malosma laurina blooms most often in late spring or early summer. 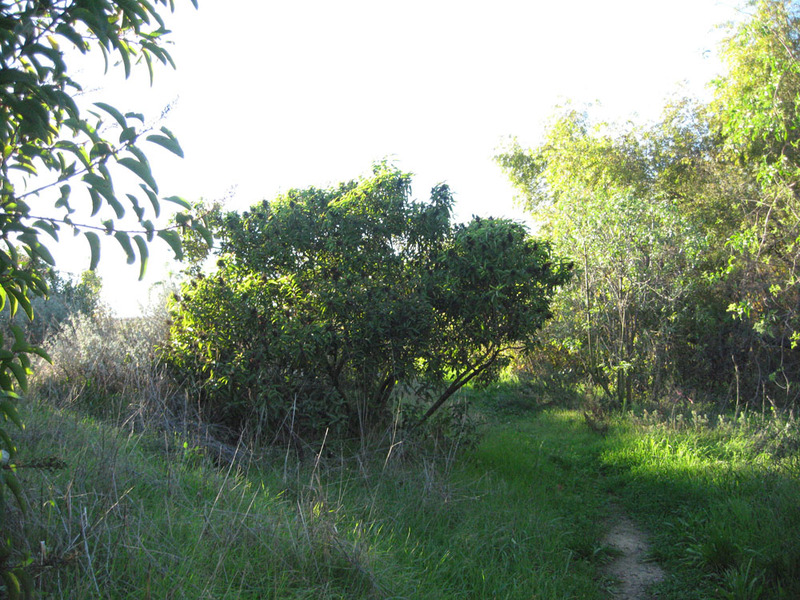 In the Gardena Willows Wetland Preserve (where our gardens are located) it commonly blooms in June or July. This is quite a showy bloomer. The flower buds are a pleasant pink that contrasts nicely with the spring leaves. The flowers themselves are creamy white. 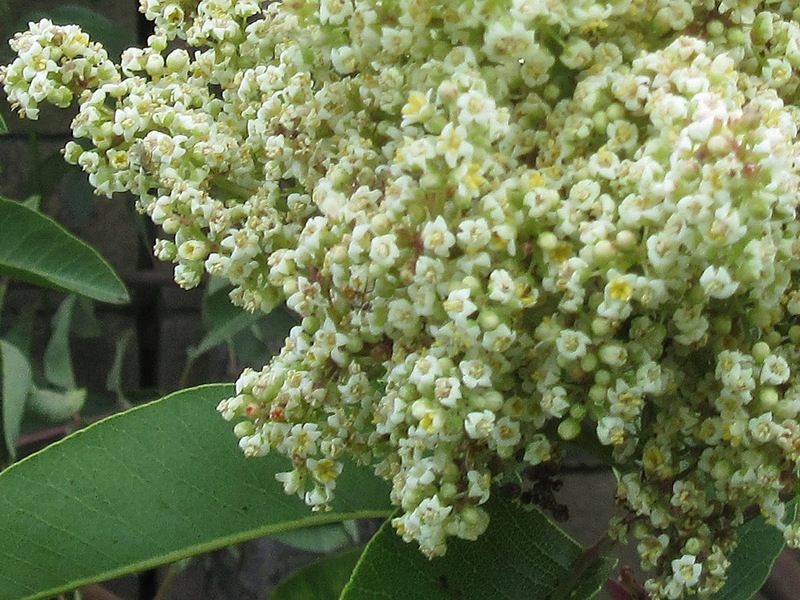 The flowers grow in dense clusters at the ends of the branches (above). The look reminds one of a lilac bush with white flowers. The flowers themselves are small, simple, with five rounded petals. The flowers can be either bisexual or unisexual (see photo above); in at least some cases, plants can be functionally either male or female. 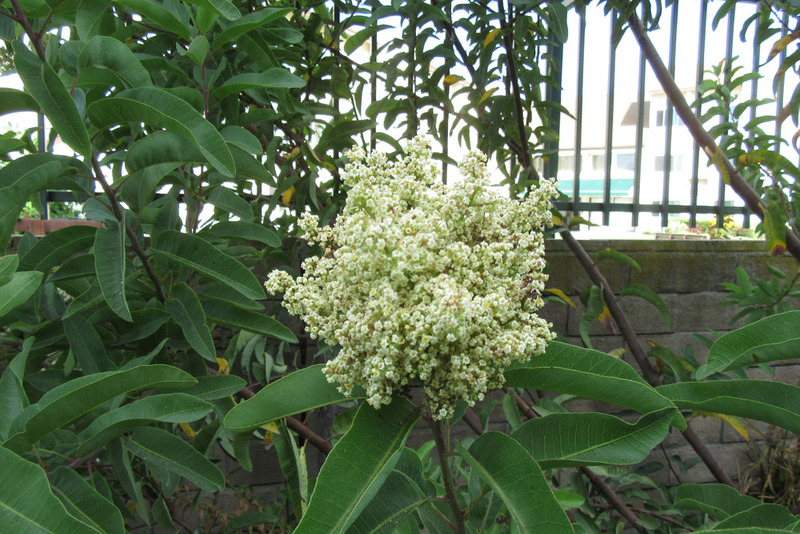 The details are currently being studied, so we’ll know more about the reproductive biology of Laurel sumac in the future. The interested reader is directed to ref. 3 (literature) for more on this fascinating topic. The flowers attract European Honey bees, native bees, pollinator flies and likely other pollinators. The fruits are small and not particularly showy. They start off green and are white when ripe. 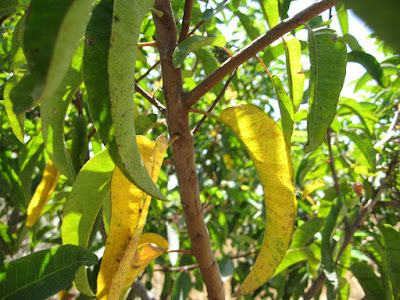 The dried fruits, which are dark brown, remain on the plant into fall and winter. The dried fruits add fall/winter interest (see below). The fruits and dried seeds are eaten by a number of seed-eating birds, but are particularly loved by song birds. In fact, this species provides good bird habitat: food, perches, shade and nesting sites. Malosma laurina takes a year or two to establish, then it grows to size fairly quickly thereafter. In the wilds, plants can live at least 30-45 years. The actual age limit is difficult to determine. Plants burn to the ground in a fire. But an underground sprouting root (lignotuber) remains alive, allowing plants to re-sprout quickly (often the first green seen after a fire). So, the age of a mature plant may be older than the age of a single trunk. 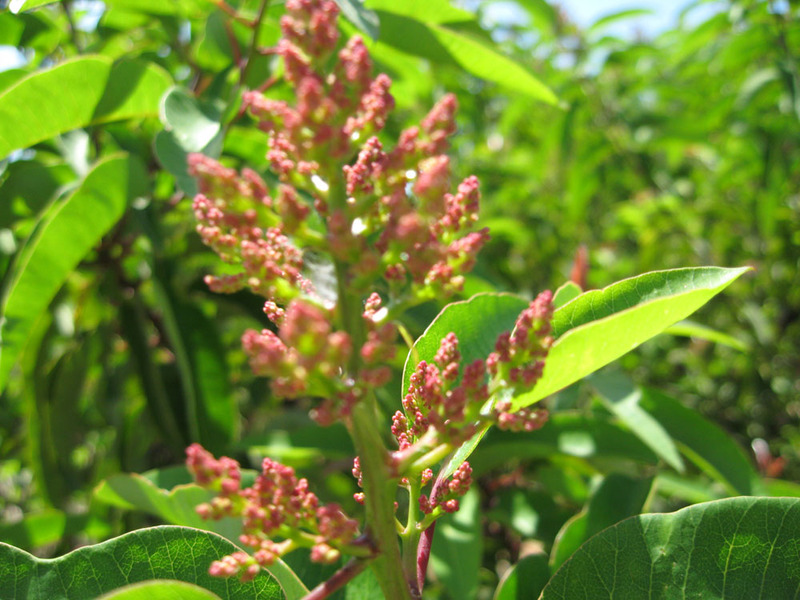 Laurel sumac needs full sun and prefers well-drained soils, with a pH 6.0-8.0. It does well on slopes (as it does in the wilds). It is intolerant of low temperatures and pH much above 8.0. 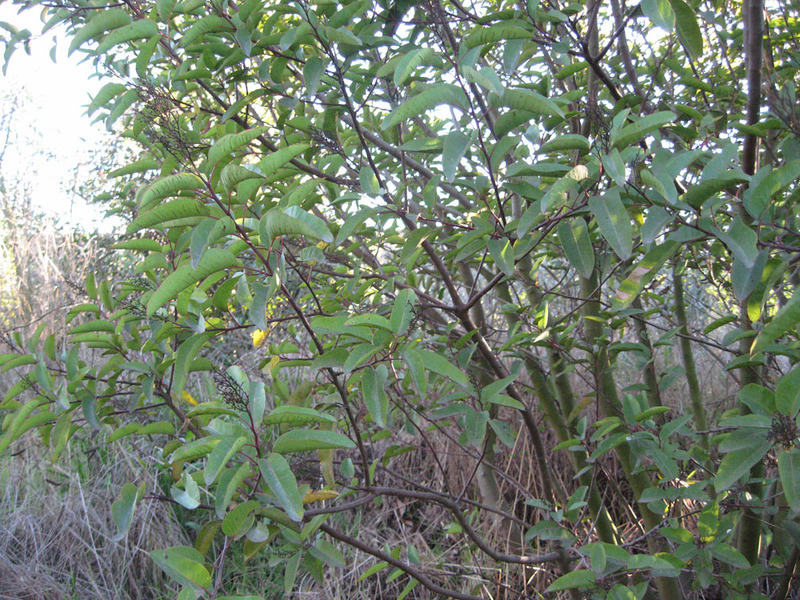 The plants are relatively insect-resistant and do best when leaf litter is allowed to accumulate (this is true of many chaparral shrub species). The plant can be pruned up as a small tree, and yearly fall trimming will keep it from getting rangy. Old shrubs can even be cut back hard (even coppiced) to rejuvenate them. Once established, Laurel sumac is quite drought resistant. Plants have roots that grow deep – 40 feet or more in some cases. Mature plants get by on occasional to no summer water (no more than one deep watering a month). But they do need adequate winter/spring water, so supplement as needed. Future climate change may prove challenging to this species. Several of us have noted branch die-back in established plants (see above). Early research suggests that this is due to fungal disease, and some individuals seem to be more susceptible than others. As with many local plant disease/pest problems, drought stress appears to be a contributing factor to susceptibility. For more on this topic see ref. 4, below. Malosma laurina is a great choice for slopes and for wildland interface areas. If planted in areas prone to wildfires, it should be planted away from structures, and the lower 1/3 of small branches removed. Laurel sumac makes a great background plant, with its evergreen leaves and flowers. 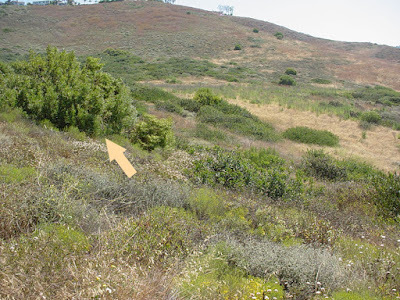 It looks particularly good when paired with its natural associates: the plants of the S. California coastal sage scrub. Like Toyon, Laurel sumac is quite versatile. It can be pruned up as a small, multi-trunk tree or used as a hedge, screen or hedgerow. As a hedge, it can be pruned formally or informally. 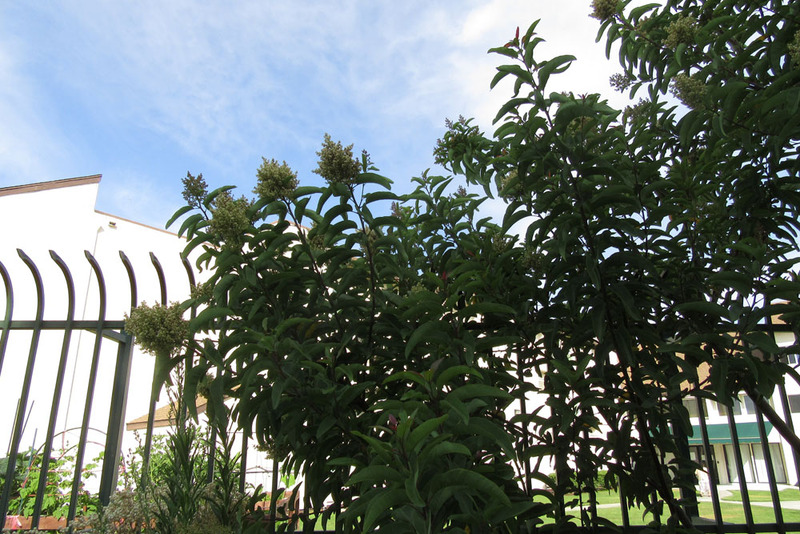 If space is limited, Laurel sumac can even be espaliered along a wall or free-standing support frame. We’re in the process of training the plant in our Bie Havn Pollinator Garden as an espalier against the back wall. In terms of practical uses, the dried fruits can be ground into flour. The young branches can be split and used in making twined baskets. The plant is a minor medicinal plant among the Chumash and Kumeyaay, who use a root bark tea for dysentery and baths for women’s ceremonies. 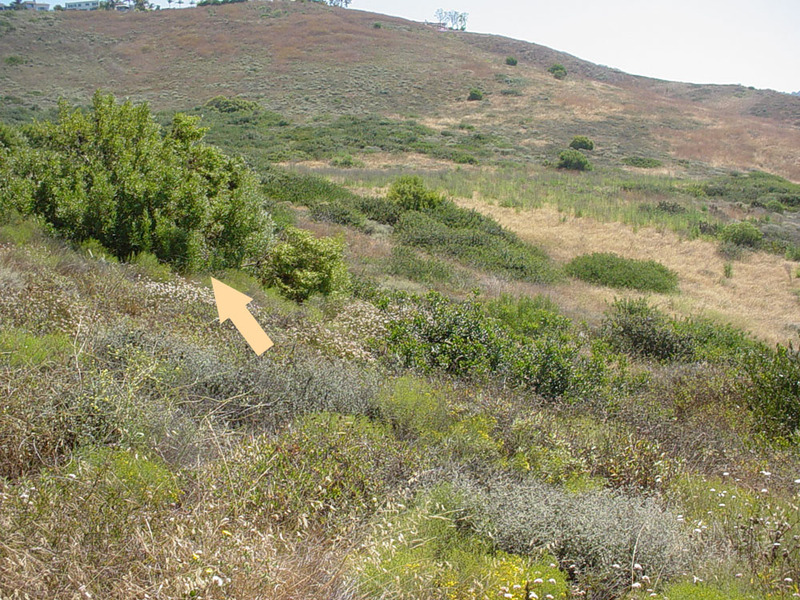 In summary, Malosma laurina is a key species of our local coastal sage scrub and chaparral plant communities. 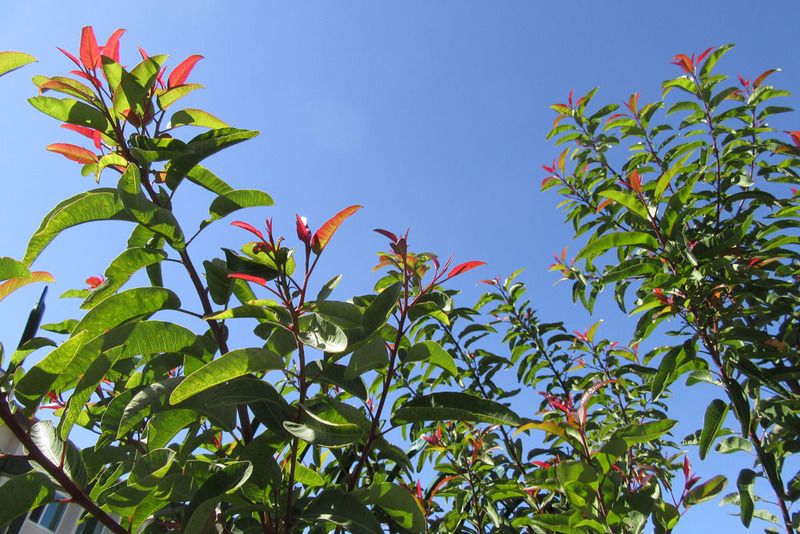 It’s an evergreen shrub with the versatility to function as a tree, hedge or espalier. It looks right at home with many of the plants used in S. Calilfornia native plant gardens. And it adds to the ‘fragrance of the wild’ that makes our S. California gardens so captivating. If you want to bring a bit of native California into your garden, this is a good shrub to consider.